Of all the specialty restaurants on Navigator of the Seas, the one that slides in "under the radar" has to be Giovanni's Table and I'm not exactly sure why. 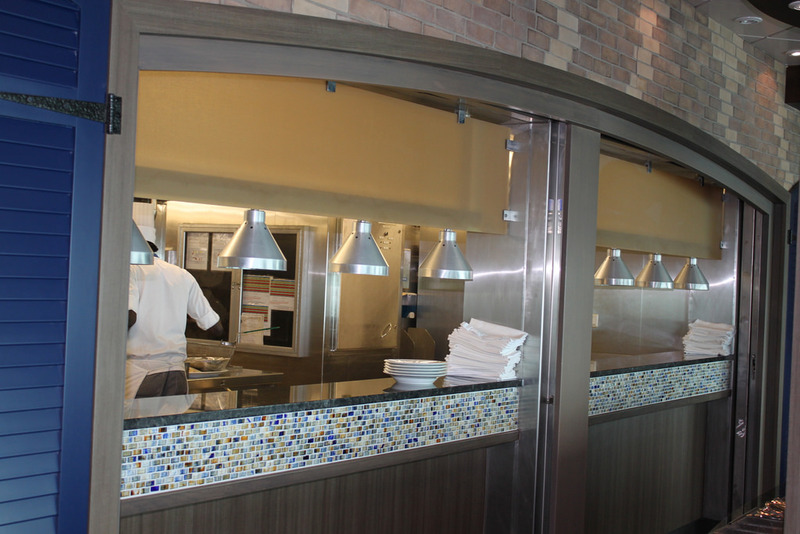 Giovanni's Table serves family-style Italian food and replaced Portofino's as the Italian specialty restaurant onboard Navigator of the Seas in February 2014. This is our second time eating at Giovanni's Table, with our first back on Oasis of the Seas in 2010. I rather enjoyed my meal last time so this time we wanted to try lunch and see how good (or bad) Giovanni's Table is on Navigator of the Seas. Giovanni's Table is located on deck 11 near the Windjammer and across from Chops Grille. As I stated earlier, it was added as part of the ship's refurbishment and I made reservations online as soon as they became available. When I showed up at 12:30pm for our lunch reservation, I found literally no one else in the restaurant. At the time this was our first specialty restaurant of the cruise so we thought maybe they just weren't popular but later found all the other specialty restaurants onboard packed. The space Giovanni's Table occupies is a large rectangular room, with lots of blues and whites. There's no checkerboard red and black stereotypical Italian restaurant decor here, it looks more like its upscale Portofino sister than Sorrento's Pizzeria. The nice thing about eating lunch at Giovanni's Table is you can see the ocean quite easily. 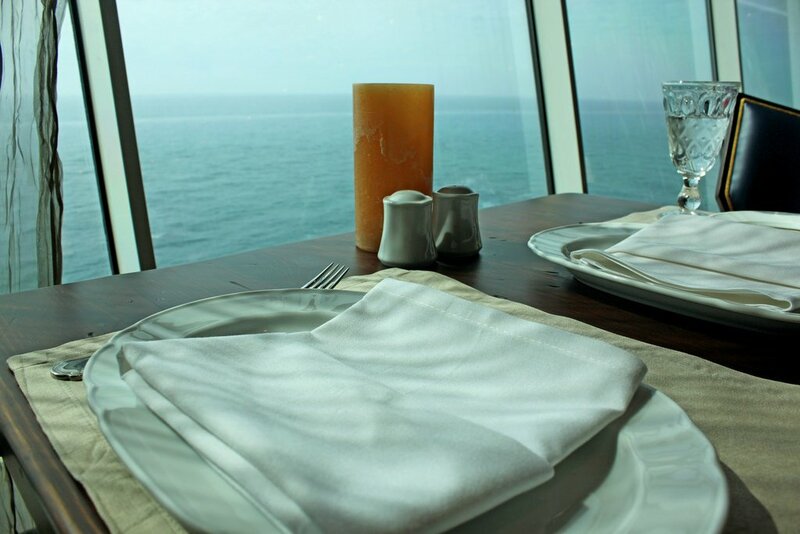 We were seated at a window table and being able to watch the ocean during our meal was calming and quite beautiful. I often point out Chops Grille misses out on having a view since it's only open for dinner and glare from the lights prevents from seeing outside, so it's nice having a view with our meal at Giovanni's Table. 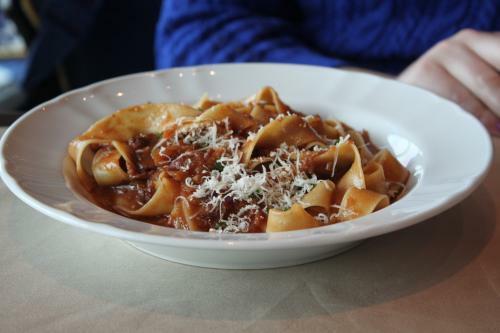 The menu at Giovanni's Table offers a number of choices, which are all supposed to be family style. Family style usually means it's a large serving meant to be shared among two or more people. Frankly, I found most dishes to be small enough for just one person to enjoy, although I may be a victim of gluttonous American dining standards. That's in contrast to my time on Oasis of the Seas a few years ago when our meal at Giovanni's Table had much larger serving sizes. That isn't a bad thing necessarily, just pointing out the difference. As with many Royal Caribbean specialty restaurants, you can order as much as you like from the menu so we started off with appetizers. The Caprese salad is always a good choice and we were quite pleased with the freshness of the ingredients. I also ordered the baked eggplant parmigiana. I'm a bit of a connoisseur of eggplant parmigiana, as it's become my go-to Italian dish in recent years. It wasn't just fried eggplant in sauce with some cheese, rather the eggplant was more lightly fried and then baked in with a combination of a great sauce and light cheese. I really enjoy it. 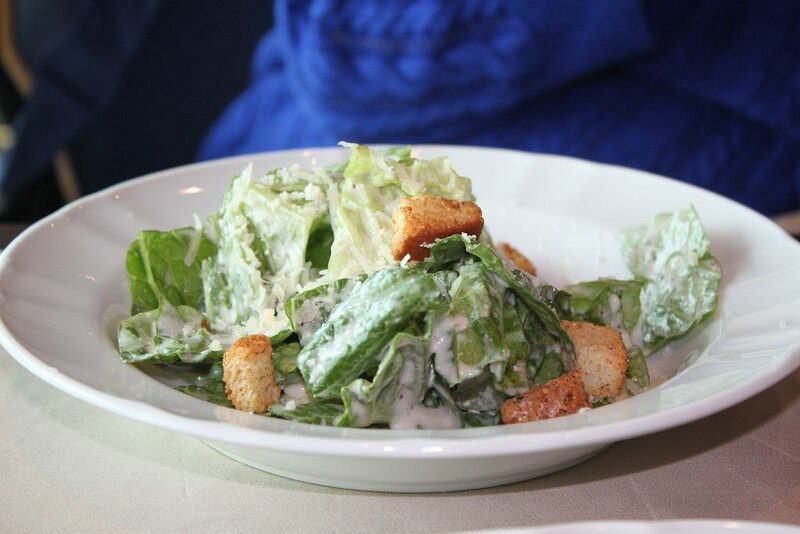 Last, but not least, my wife also wanted to sample their Caesar salad. My wife's ideal Caesar salad is a salad where it's only made up of the dark green lettuce leaves, as opposed to the light green crunchy part. This salad was about as close to perfection as she's seen in some time in that regard. 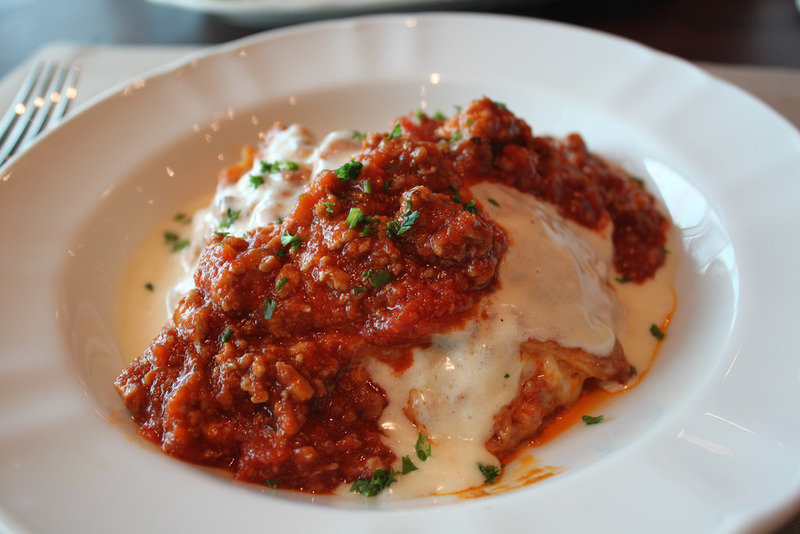 For our entrees, I decided to keep it traditional and try their lasagna and meatballs. First came the lasagna, which is described by Royal Caribbean as a traditional meal lasagna. 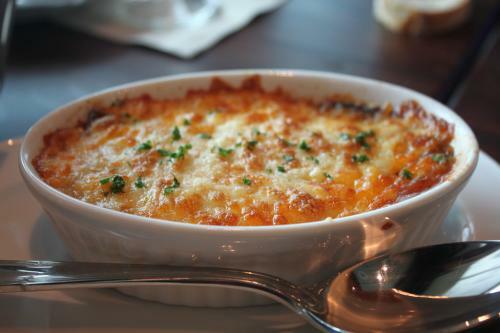 What I liked about the lasagna was that it was topped in meat sauce and a light use of cheese (not the shredded kind). I feel like lasagna should be more about the meat and pasta and less about the cheese and this hit the nail on the head. I ordered the meatballs because the waiter mentioned the meatballs as being what the restaurant was known for and I think I read a few other places about the meatballs too. 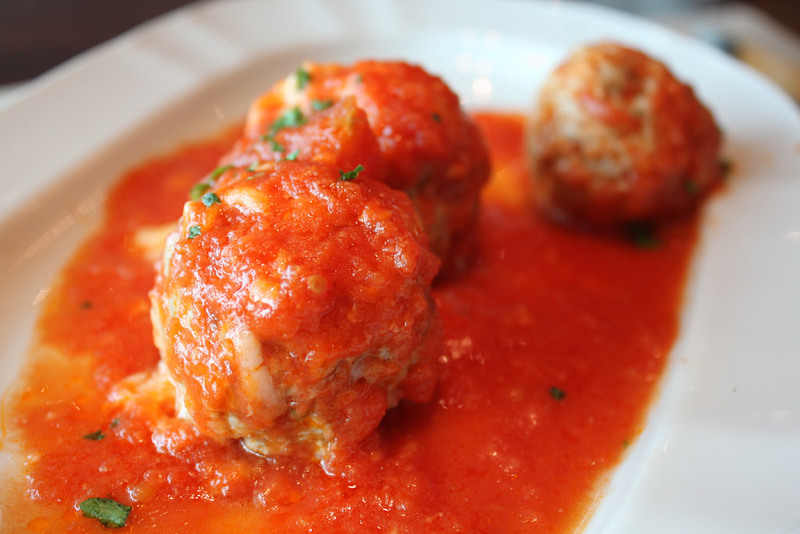 Being someone who usually goes for a "When in Rome..." kind of attitude, I ordered the veal meatballs to give it a try. I will be honest and say I did not love the meatballs, however, I feel that could be because I don't really like veal and not because the meatballs were of poor quality. 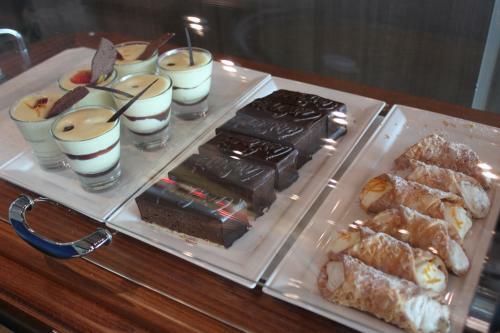 Dessert at Giovanni's Table is offered from the dessert cart (there is no menu, per se). The waiter brings the cart over and you pick out what you would like. My wife decided to try the pappardelle pasta in a radicchio cream and pancetta. It sounded good to her but it was something she had never tried before. She found the pasta to be interesting and she ate it but different than what she was used to ordering at an Italian restaurant. I think she liked it overall but noted it was a little more different than she thought it would be. I was stuffed so I took the chocolate cake to try and it was tasted great, although I chose not to eat more than a bite or two. My wife sampled the canoli because in her perfect world, after the Caesar salad with only dark green leaves are served, it will be followed by a parade of canolis. She really enjoy their canoli and gave it a thumbs up. Giovanni's Table stood out for us because of the freshness of the food we had. My pet peeve is food that tastes like it just came out of a microwave but I really felt like what we ordered was prepared at the time and tasted wonderful. It's also worth noting lunch is only $15 per person, which for what you get is a great value. Given what you get for the money, it's one of the better deals on Navigator of the Seas and for lunch it was well worth it. I also need to point out how good our waiter was because my daughter was in a foul mood that day (she needed a nap and was hungry). Had the restaurant not been empty, I'm sure me or my wife would have brought her back to the stateroom as not to bother the other diners. Our waiter really went above and beyond by trying to entertain her with tricks, tours of the galley and even letting her sit on the Vespa scooter that is near the entrance. The little things he did to keep her happy really made our meal enjoyable and stood out as why specialty restaurant waiters are among the best Royal Caribbean has. I think the food at Giovanni's Table is quite good and if you like Italian food at all, it's hard not to go wrong here. I won't pretend that the food at Sabor and Chops Grille were tastier, but considering Giovanni's Table is open for lunch whereas the others are not, I think it makes for a perfect choice for lunch. Giovanni's Table is open for lunch 12:00pm to 3:30pm and open for dinner 6:00pm to 10:00pm and we reviewed Giovanni's Table on Navigator of the Seas.